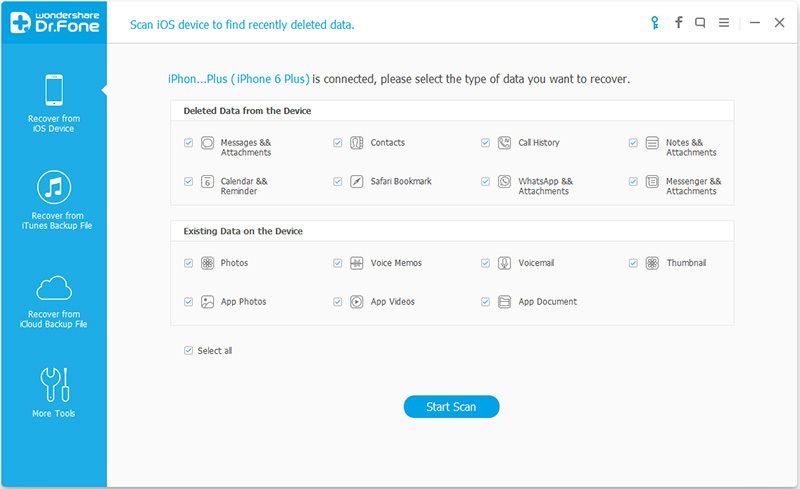 Here is the iOS Data Recovery guide for how to use the feature “Recover from iOS Device” in Dr.Fone for Recovering Data from iPhone/iPad/iPod/iCloud/iTunes Backup. 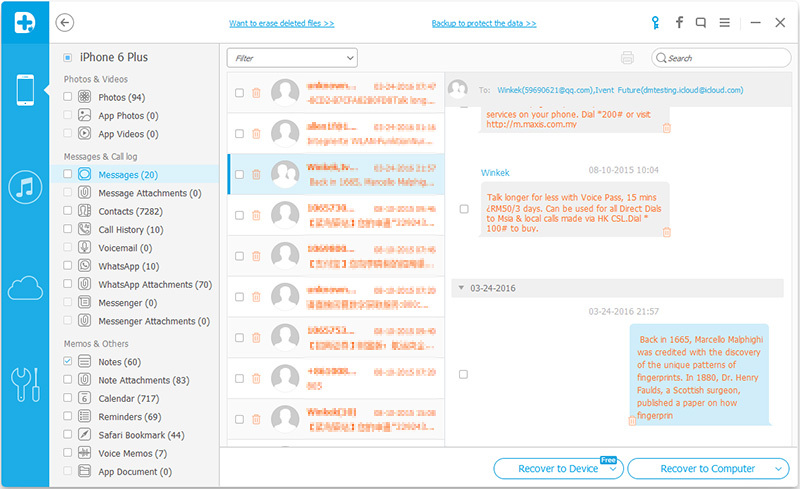 Dr.Fone for iOS is specialized iPhone, iPad and iPod Touch Data recovery software. It can recover deleted or lost data selectively from iDevice as well as from iCloud and iTunes backup file. 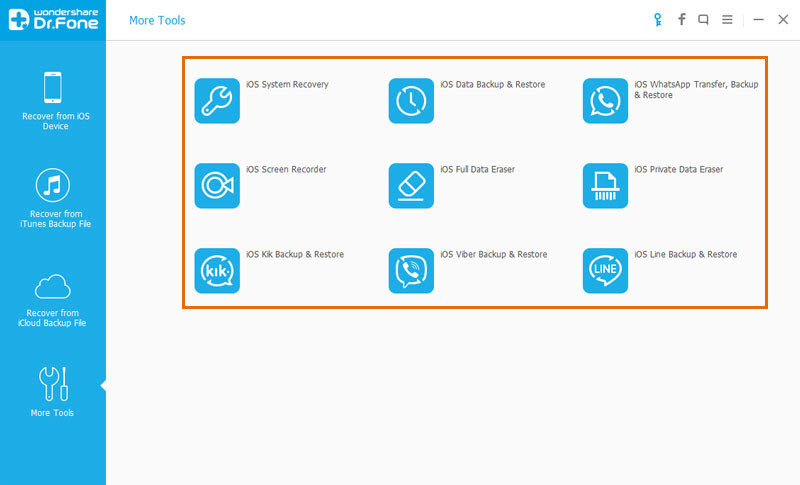 With the best iOS Data Recovery, recovering lost data is not a decision of all-or-nothing anymore, you can select whatever you need to recover. And the recovering is as easy as a few clicks. Simple and straight forward – because you simply just want your data back – now Connect your phone to your computer, scan it and recover. In just a few clicks, what was lost is found. How Dr.Fone for iOS works? Launch Dr.Fone on your computer. Use the USB cable that comes with your iOS device to connect your iPhone, iPad or iPod touch, to your computer. By default, Dr.Fone will detect your iOS device automatically and show you the window for “Recover from iOS Device”. Tips: Before running Dr.Fone, you’re supposed to download the latest version of iTunes. To avoid the automatically sync, don’t launch iTunes when running Dr.Fone. I suggest you disable the automatical syncing in iTunes beforehand: launch iTunes > Preferences > Devices, check “Prevent iPods, iPhones, and iPads from syncing automatically”. The scan will take you some time. Once it’s completed, you can see a scan result generated by the program. Data both lost and existing on your device are displayed in categories. To filter out the deleted data on your iOS device, you can swipe the option “Only display the deleted items” to ON. 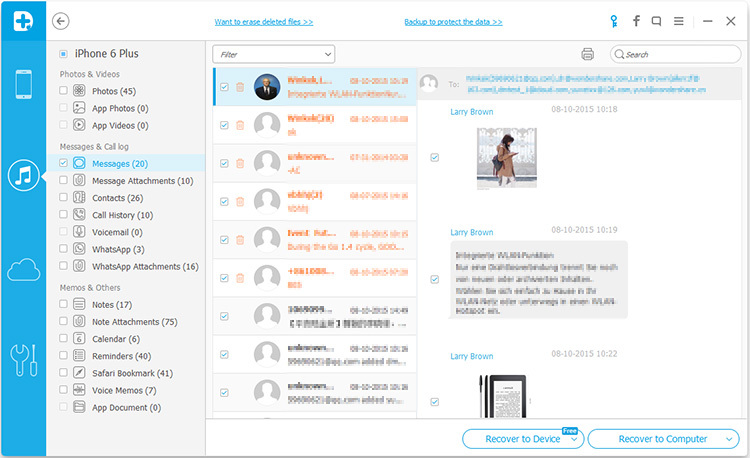 By clicking the file type in the left side, you can preview the found data. And you can see there is a search box on the top right of the window. You can search for a specific file by typing a keyword in the search box. 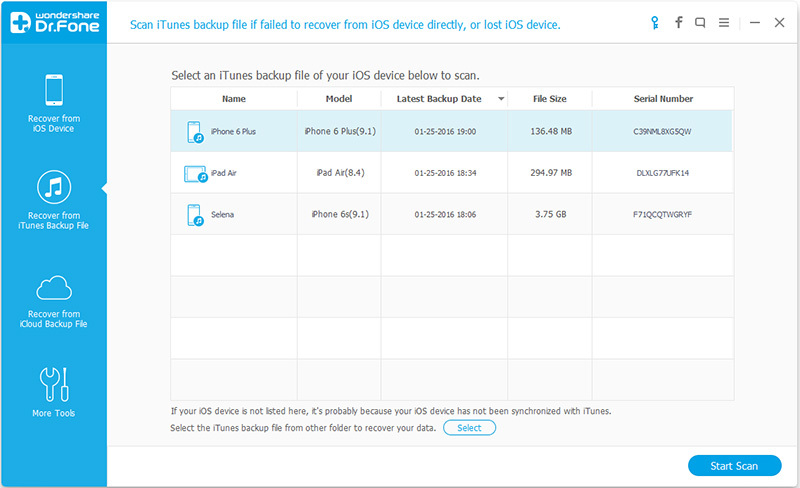 Launch Dr.Fone and click “Recover from iTunes Backup File”. After then, the iTunes backup recovery tool will detect all iTunes backup files on this computer and display them in the window. You can confirm which one is the one you need according to the date it has been created. 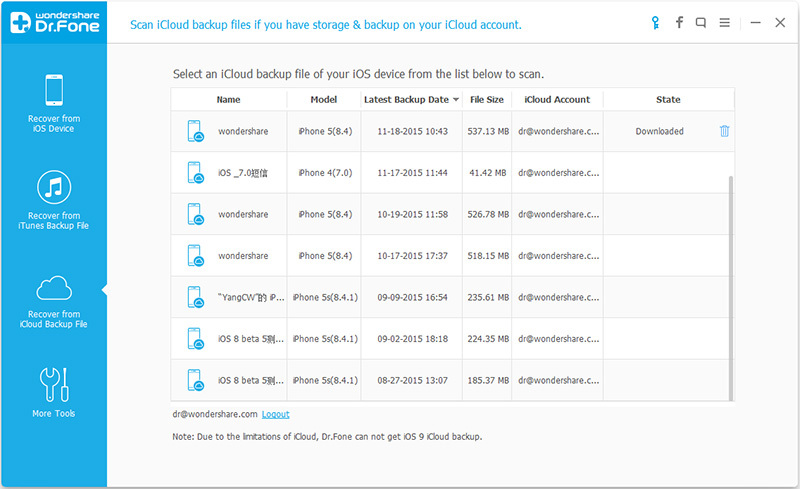 After running Dr.Fone, choose the recovery mode of “Recover from iCloud Backup Files” on the top. Then you’ll see the window below. 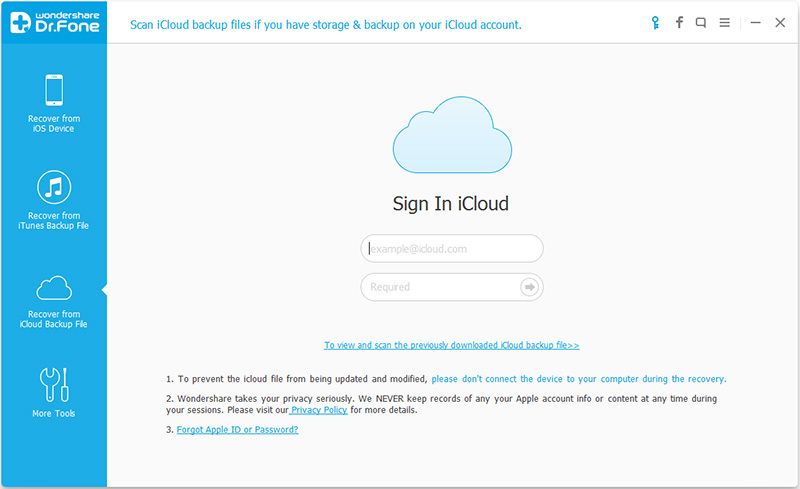 Enter your iCloud account and password to login. Dr.Fone takes your privacy seriously. We never keep a record of any your Apple account info or content at any time during your sessions. 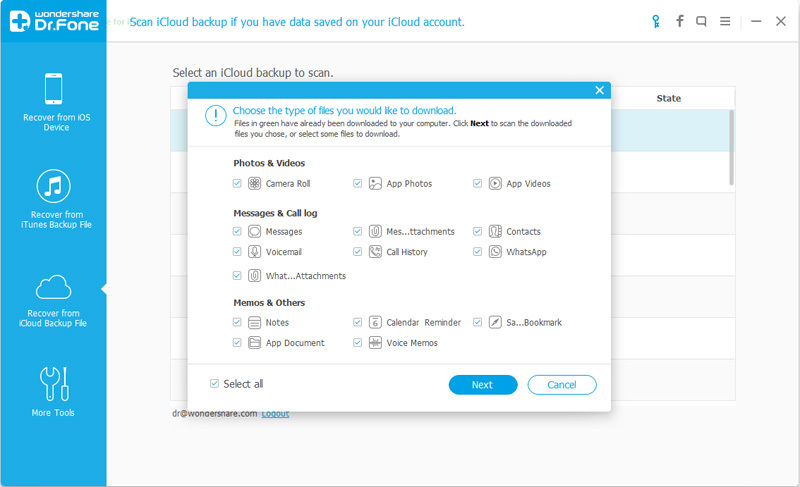 When you logged into iCloud, the program can find all iCloud backup files in your account. Choose the one where you’re going to recover data and click on the “Download” button. The scan will be complete in a few minutes. 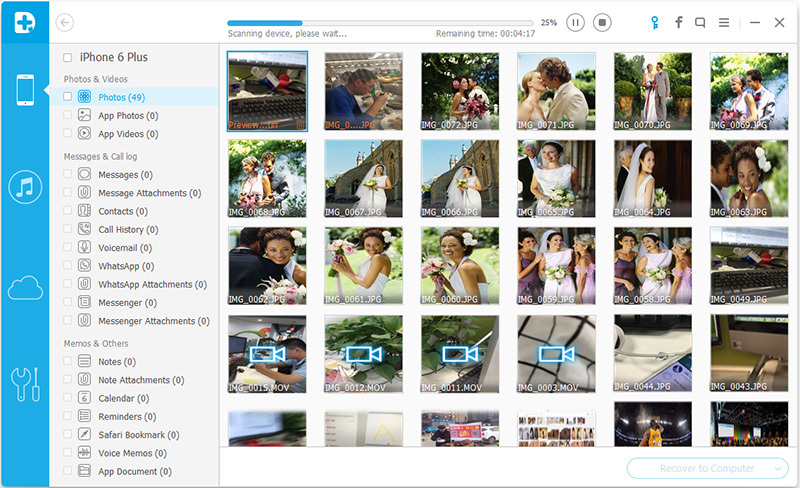 Once it stops, you can preview almost all data in your iCloud backup file, like contacts, messages, photos, and more. Check them one by one and tick the item you want. Then click on the “Recover to Computer” or “Recover to your device” button to save them on your computer or your device with one click. Now contacts, messages and notes can be directly recovered to your iOS device if your iPhone, iPad or iPod touch is connected with your computer with a USB cable during the recovery process.